Keep your baby's milk and food warm with LuvLap Royal Bottle & Food Warmer! This appliance has an adjustable temperature system which makes food warming an easy process. Spacious with large inner capacity, most baby bottle sizes fit in this warmer. It warms the milk evenly without causing hotspots. 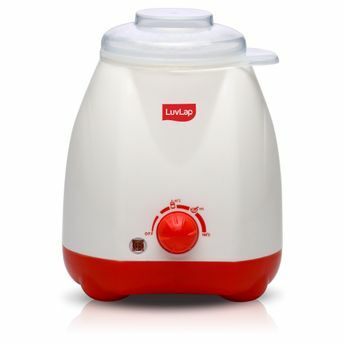 LuvLap Royal Bottle & Food Warmer comes with feeding bowl, which makes heating baby meals easy. It also comes with a juicer that helps make fruit juices for babies. This warmer also can be used to defrost milk and other food items.